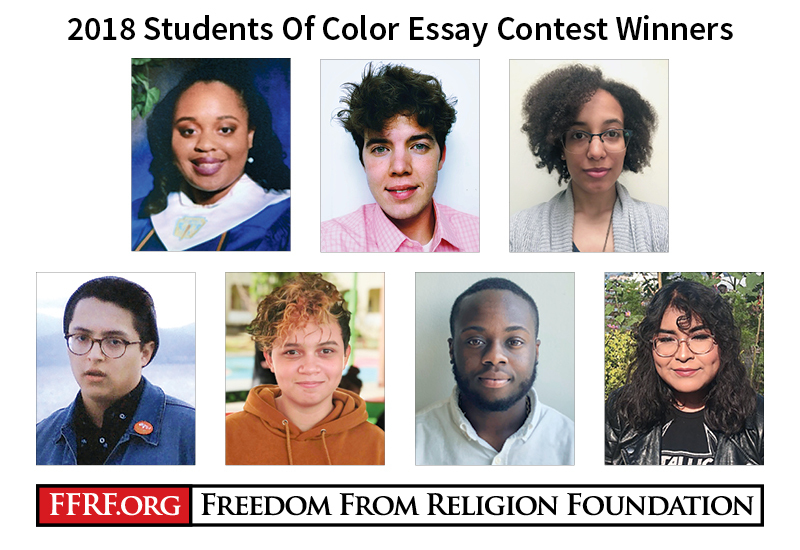 The Freedom From Religion Foundation is proud to announce the 15 winners of the 2018 David Hudak Memorial Students of Color Essay Competition for College Students. FFRF has paid out a total of $10,550 in award money for this year’s contest. This is the third year FFRF has offered a contest geared specifically to acknowledge and reward freethinking students of color, and the challenges they face as a minority within the nonreligious minority. FFRF’s three other contests — for college-bound high school seniors (announced last month), for ongoing college students (to be announced later in August) and for grad students (to be announced in September) — are open to any student. FFRF first started offering college essay competitions in 1979, adding high school senior contests in 1994 and graduate students in 2010. “We feel that these scholarships encouraging young freethinkers to express themselves and rewarding their independent thinking is one of FFRF’s most important projects — an investment in the future,” says FFRF Co-President Annie Laurie Gaylor. The contest is named for the late David Hudak, an FFRF member who left a bequest designated to generously fund a student essay contest. The winning essays will be reprinted or excerpted in the upcoming September issue of Freethought Today, a periodical that is included with membership in FFRF. FFRF thanks FFRF members Dean and Dorea Schramm of Florida for providing a $100 bonus to students who are members of a secular student club or other freethinking group. The grand total reflects those bonuses.